For other uses, see The Hound of the Baskervilles (disambiguation). The Hound of the Baskervilles is the third of the four crime novels written by Sir Arthur Conan Doyle featuring the detective Sherlock Holmes. Originally serialised in The Strand Magazine from August 1901 to April 1902, it is set largely on Dartmoor in Devon in England's West Country and tells the story of an attempted murder inspired by the legend of a fearsome, diabolical hound of supernatural origin. Sherlock Holmes and his companion Dr. Watson investigate the case. 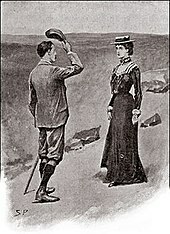 This was the first appearance of Holmes since his apparent death in "The Final Problem", and the success of The Hound of the Baskervilles led to the character's eventual revival. One of the most famous stories ever written, in 2003, the book was listed as number 128 of 200 on the BBC's The Big Read poll of the UK's "best-loved novel." In 1999, it was listed as the top Holmes novel, with a perfect rating from Sherlockian scholars of 100. Dr. James Mortimer asks Sherlock Holmes for advice after his friend Sir Charles Baskerville was found dead in the park surrounding his manor, in the moors of Devonshire. The death was attributed to a heart attack but, according to Mortimer, Sir Charles's face retained an expression of horror and not far from the corpse the footprints of a gigantic hound were clearly visible. 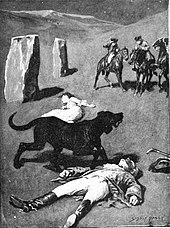 According to an old legend, a curse runs in the Baskerville family since the time of the English Civil War, when a Sir Hugo Baskerville abducted and murdered a woman in the mires of Dartmoor, only to be killed in turn by a huge demonic hound. Allegedly the same creature has been haunting the place ever since, causing the premature death of many Baskerville heirs. Sir Charles believed in the plague of the hound and so does Mr. Mortimer, who now fears for the next in line Sir Henry Baskerville. Even if he dismisses the whole curse story as nonsense, Holmes accepts to meet Sir Henry in London as soon as the latter arrives from Canada, where his branch of the family had moved in the past. The man is a young and jovial good-looking fellow, skeptical toward the grim legend and eager to take possession of Baskerville Hall, even if he's just found an anonymous note in the mail, warning him to stay away from the moor. When someone tries to shoot Sir Henry while he's walking down a street, however, Holmes asks Watson to go with the young man and Mortimer to Dartmooor, in order to protect Sir Henry and search for any clue about who's menacing his life. The trio arrives to Baskerville Hall, an old and imposing manor in the middle of a vast park, managed by a butler and his wife the housekeeper. The estate is surrounded by the moor and borders the Grimpen Mire, where animals and humans can sink to death in quicksand. The news that a convict has escaped from the local penitentiary and is hiding on the nearby hills, add up to the barren landscape and the gloomy atmosphere. Unexplicable events happen during the first night, keeping the guests awake and only in the daylight Watson and Sir Henry can relax while exploring the neighborhood and meet the scarse but peculiar residents of Dartmoor. 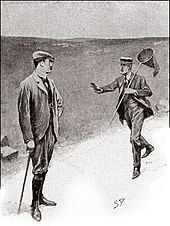 Watson keeps on searching for any lead to the identity of whoever's attempting to Sir Henry's life and faithfully wires the details of his investigation to Holmes. Among the others stand out the Stapletons, brother and sister; the man is overfriendly and a bit too curious toward the newly arrived, while the woman, a rare beauty, seems all too weary of the place. Distant howls and strange sightings trouble Watson during his long walks on the hills, and his mood gets no better even inside Baskerville Hall. The doctor grows suspicious of the butler, who at night acts like he was signaling to someone in the moor with a candle from a window of the house. In the meantime Sir Henry is drawn to Ms. Stapleton, who seems to be afraid of her brother's opinion on the matter. To make the puzzle more complex there are Mr. Mortimer, maybe too eager to convince Sir Henry that the curse is real, an old and grumpy neighbour, who likes to pry with his telescope into other people's houses, a beautiful woman with unclear ties to Sir Charles and even a bearded man roaming free in the hills and apparently hiding on a tor where ancient tombs have been excavated by Mr. Stapleton for unclear purpose. For all the good Watson's efforts, it will be Sherlock Holmes in person to connect all the clues and solve the mistery, but not before the spectral hound kills again. Conan Doyle had not written about Sherlock Holmes in eight years, having killed off the character in the 1893 story "The Final Problem". 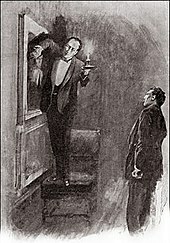 Although The Hound of the Baskervilles is set before the latter events, two years later Conan Doyle would bring Holmes back for good, explaining in "The Adventure of the Empty House" that Holmes had faked his own death. He was assisted with the plot by a 30-year-old Daily Express journalist named Bertram Fletcher Robinson (1870–1907). His ideas came from the legend of Richard Cabell (d.1677), of Brook Hall, in the parish of Buckfastleigh, Devon, which was the fundamental inspiration for the Baskerville tale of a hellish hound and a cursed country squire. Cabell's tomb survives in the village of Buckfastleigh. Squire Richard Cabell lived for hunting and was what in those days was described as a 'monstrously evil man'. He gained this reputation for, amongst other things, immorality and having sold his soul to the Devil. There was also a rumour that he had murdered his wife, Elizabeth Fowell, a daughter of Sir Edmund Fowell, 1st Baronet (1593–1674), of Fowelscombe. On 5 July 1677, he died and was laid to rest in the sepulchre. The night of his interment saw a phantom pack of hounds come baying across the moor to howl at his tomb. From that night on, he could be found leading the phantom pack across the moor, usually on the anniversary of his death. If the pack were not out hunting, they could be found ranging around his grave howling and shrieking. In an attempt to lay the soul to rest, the villagers built a large building around the tomb, and to be doubly sure a huge slab was placed. Moreover, Devon's folklore includes tales of a fearsome supernatural dog known as the Yeth hound that Conan Doyle may have heard. 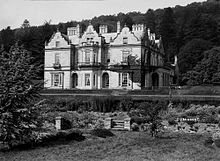 It is believed by Weller (2002) that Baskerville Hall is based on one of three possible houses on or near Dartmoor, namely Fowelscombe in the parish of Ugborough, the seat of the Fowell Baronets; Hayford Hall, near Buckfastleigh (also owned by John King (d.1861) of Fowelscombe) and Brook Hall, in the parish of Buckfastleigh, about two miles east of Hayford, the actual home of Richard Cabell (d.1677), husband of Elizabeth Fowell. It has also been claimed that Baskerville Hall is based on a property in Mid Wales, built in 1839 by one Thomas Mynors Baskerville. The house was formerly named Clyro Court and was renamed Baskerville Hall towards the end of the last century. Arthur Conan Doyle was apparently a family friend who often stayed there and may have been aware of a local legend of the hound of the Baskervilles. Still other tales claim that Conan Doyle was inspired by his time on holiday in North Norfolk, where the tale of Black Shuck is well known. The pre-Gothic Cromer Hall, where Conan Doyle stayed, also closely resembles Doyle's vivid descriptions of Baskerville Hall. James Lynam Molloy, a friend of Doyle's, and author of 'Love's Old Sweet Song', married Florence Baskerville, daughter of Henry Baskerville of Crowsley Park,Oxfordshire. The gates to the park had statues of hell hounds, spears through their mouths. Above the lintel there was another statue of a hell hound. In 1902, Doyle's original manuscript of the book was broken up into individual leaves as part of a promotional campaign by Doyle's American publisher - they were used as part of window displays by individual booksellers. Out of an estimated 185-190 leaves, only 36 are known to still exist, including all the leaves from Chapter 11, held by the New York Public Library. Other leaves are owned by university libraries and private collectors. A newly rediscovered example was sold at auction in 2012 for US$158,500. The novel uses many traditional novelistic techniques which had been largely abandoned by the time of writing, such as letters, diary extracts, interpolated manuscripts, and the like, as seen in the works of Henry Fielding and, later, Wilkie Collins. It incorporates five plots: the ostensible 'curse' story, the two red-herring subplots concerning Selden and the other stranger living on the moor, the actual events occurring to Baskerville as narrated by Watson, and the hidden plot to be discovered by Holmes. 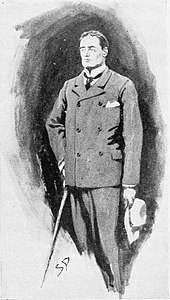 Doyle wrote that the novel was originally conceived as a straight 'Victorian creeper' (as seen in the works of J. Sheridan Le Fanu), with the idea of introducing Holmes as the deus ex machina only arising later. The Hound of the Baskervilles was first serialized in The Strand Magazine in 1901. It was well-suited for this type of publication, as individual chapters end in cliffhangers. It was printed in the form of a novel the following year. The Hound of the Baskervilles has been adapted for many media. Over 20 film and television versions of The Hound of the Baskervilles have been made. 1951 Jighansa India Ajoy Kar Sishir Batabyal as Detective Smarajit Sen ? 1995 Wishbone - "The Slobbery Hound" United States Fred Holmes "Wishbone"
The Hound of the Baskervilles has been adapted for radio for the BBC by Bert Coules on two occasions. The first starred Roger Rees as Holmes and Crawford Logan as Watson and was broadcast in 1988 on BBC Radio 4. Following its good reception, Coules proposed further radio adaptations, which eventually led to an entire dramatisation of the canon for radio, starring Clive Merrison as Holmes and Michael Williams as Watson. The second adaptation of The Hound of the Baskervilles, featuring this pairing, was broadcast in 1998, and also featured Judi Dench as Mrs Hudson and Donald Sinden as Sir Charles Baskerville. In 2007, Peepolykus Theatre Company premiered a new adaptation of The Hound of the Baskervilles at West Yorkshire Playhouse in Leeds. Adapted by John Nicholson and Steven Canny, the production involves only three actors and was praised by critics for its physical comedy. Following a UK tour, it transferred to the Duchess Theatre in London's West End. The Daily Telegraph described it as a 'wonderfully delightful spoof', whilst The Sunday Times praised its 'mad hilarity that will make you feel quite sane'. This adaptation continues to be presented by both amateur and professional companies around the world. Ken Ludwig authored an adaptation entitled Baskerville: A Sherlock Holmes Mystery which premiered as a co-production at Arena Stage (Washington, D.C.) in January 2015 and McCarter Theatre Center in March 2015. A two hander farcical version of the story penned by Thomas Moore (Director) played in a purpose built theatre in Manchester for 5 months during 2017. A new production of the same script will premiere at The Lowry in October 2018 before a month long run in London over Christmas 2018 and a UK Tour in 2019. The Hound of Baskervilles serves as the primary inspiration for the final case in Dai Gyakuten Saiban: Naruhodō Ryūnosuke no Bōken in which the protagonist teams up with Sherlock Holmes to investigate mysteries based on various entries in the Holmes chronology. Sherlock Holmes and the Hound of the Baskervilles is a casual game by Frogwares. It departs from the original plot by introducing clear supernatural elements. Despite its non-canonical plot, it received good reviews. The movie The Life and Death of Colonel Blimp (1941) makes references to The Hound of the Baskervilles. Disney cartoonist Carl Barks parodied this story with The Hound of the Whiskervilles (1960), starring Uncle Scrooge. A 1965 issue of Walt Disney's Comics and Stories (comic book) featured The Hound of Basketville, starring Mickey Mouse, Goofy, Gladstone Gander, and Pluto, as Sherlock Mouse, Doctor Goofy, Sir Gladstone Basketville, and the hound. Stapleton reappears in Richard L. Boyer's version of The Giant Rat of Sumatra (1976). It turns out that he did not die, as Holmes and Watson assumed, but had escaped by another route, committing further crimes and vowing vengeance on Sherlock Holmes. William of Baskerville, protagonist of Umberto Eco's novel The Name of the Rose (1980), is a Franciscan friar and a sleuth, inspired by Sherlock Holmes and perhaps William of Occam and other real and fictional characters. The hound of the Baskervilles is a character in Kouta Hirano's supernatural manga series Hellsing (1997-2008). Spike Milligan satirised the novel in his book, The Hound of the Baskervilles According to Spike Milligan (1997), combining elements of the original novel with the Basil Rathbone serials. The Moor (1998), a novel in Laurie R. King's series about Sherlock Holmes and Mary Russell, uses the setting and various plot elements, with Holmes returning to Dartmoor on a later case. Pierre Bayard's book Sherlock Holmes Was Wrong (2008) re-opens the case and, by careful re-examination of all the clues, clears the hound of all wrongdoing and argues that the actual murderer got away with the crime completely unsuspected by Holmes, countless readers of the book over the past century—and even, in a sense, the author himself. ^ a b Rendell, Ruth (12 September 2008). "A most serious and extraordinary problem". The Guardian. Retrieved 8 December 2018. ^ Connan-Doyle, Arthur, Sir. The Hound of the Baskervilles. Project Gutenberg. ^ Spiring, Paul (2007). "Hugo Baskerville & Squire Richard Cabell III". BFROnline. Retrieved 29 March 2009. ^ "Cabell Tomb — Buckfastleigh". Devon Guide. 2007. Retrieved 29 March 2009. ^ "Buckfastleigh Church". Legendary Dartmoor. 22 November 2007. Retrieved 29 March 2009. ^ Stock, Randall (June 10, 2013). "The Hound of the Baskervilles: A Manuscript Census". bestofsherlock.com. Retrieved 9 October 2013. ^ "DOYLE, Sir Arthur Conan (1859-1930). Autograph manuscript leaf from The Hound of the Baskervilles, first serialized in The Strand Magazine, August 1901-April 1902, published in book form by George Newnes, on 25 March 1902". Christies. Retrieved 9 October 2013. ^ "Publication of the Hound of the Baskervilles". History Today. ^ Alan Barnes (2002). Sherlock Holmes on Screen. Reynolds & Hearn Ltd. p. 182. ISBN 978-1-903111-04-8. ^ "L'Ultimo dei Baskerville (TV episode 1968)". The Arthur Conan Doyle Encyclopedia. Retrieved 24 November 2018. ^ O'Connor, John J. (8 December 1988). "Review/Television; Holmes, Hounds and Haunted Halls". The New York Times. Retrieved 24 November 2018. ^ "Wishbone". TV Guide. Retrieved 23 November 2018. ^ "Sherlock Holmes in the 22nd Century". TV Guide. Retrieved 23 November 2018. ^ Teti, John (11 March 2016). "Sherlock: "The Hounds Of Baskerville"". The A.V. Club. Retrieved 23 November 2018. ^ The episode is based on "The Adventure of the Dancing Men" also. ^ Valentine, Genevieve (11 March 2016). "Elementary aims high and falls short on adaptation". The A.V. Club. Retrieved 23 November 2018. ^ Bert Coules. "The Hound of the Baskervilles". The BBC complete audio Sherlock Holmes. Retrieved 12 December 2016. ^ "Licencing, The Hound of the Baskervilles, Peepolykus Theatre Company". Peepolykus.com. Archived from the original on 28 October 2014. Retrieved 28 October 2014. ^ Purcell, Carey (January 15, 2015). "Ken Ludwig's Baskerville: A Sherlock Holmes Mystery Makes World Premiere Tonight". Playbill. Retrieved January 2, 2018. ^ "Sherlock Holmes and the Hound of the Baskervilles". bigfishgames.com. Retrieved 2 June 2016. ^ Uncle Scrooge #29, Dell, 1960. 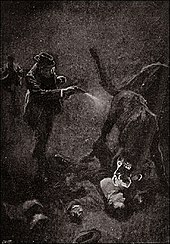 Wikimedia Commons has media related to The Hound of the Baskervilles. The Hound of the Baskervilles (Part I) at BFRonline.biz. The Hound of the Baskervilles (Part II) at BFRonline.biz. The Hound of the Baskervilles (Conclusion) at BFRonline.biz.